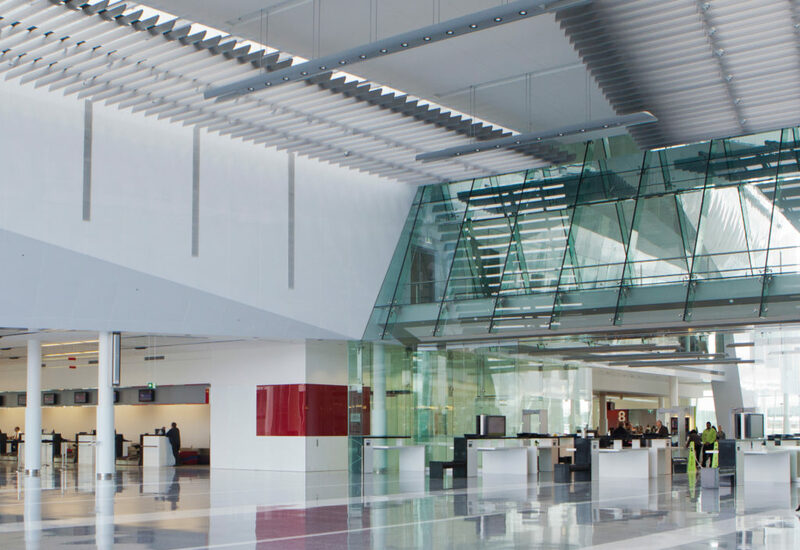 Your safety and security is the highest priority at Canberra Airport. Accordingly, a number of security measures have been implemented in line with aviation security directives from the Australian Federal Government before a passenger or visitor may enter the secure area of the airport terminal or board a flight. When checking in, airline staff will query whether you have any hazardous items in your check-in or cabin baggage. Flammable goods, gas cylinders, acids and poisons are all considered hazardous and will not be allowed on the aircraft. These may include items such as lithium batteries, bleaches, paints and some aerosol containers. For more information on restrictions applicable to dangerous goods visit www.casa.gov.au. Once checked in, your carry-on and checked baggage will also be subject to security screening requirements. Before accessing the sterile area or departures councourse, you will be subject to a security screening process. This is to check for items that are not permitted to be carried on the aircraft, either on your person or in cabin baggage. All items that you take into the sterile area must be x-ray screened. This includes carry-on bags, wallets and any items in your pockets. Persons and items will be selected on a random basis to undergo explosive trace sampling. All cutting implements (such as knives, scissors, etc.) and sharp objects (metal cutlery, letter openers, razor blades etc.) are prohibited items in the aircraft cabin. These items may be carried in your checked-in baggage and stored in the aircraft hold. Beverage containers of any description (empty or otherwise) are not to be carried through the walkthrough metal detector for the purpose of screening and clearing. Only sealed containers (flask, thermos etc) may be submitted for x-ray screening. A beverage such as a coffee cup with lid does not constitute a sealed container as the liquid may cause damage to the x-ray apparatus. For more information on what you can take through domestic security screening visit the TravelSECURE website. For information on travelling with children, including carry-on baby products, please see the TravelSECURE website. When you fly internationally from Canberra Airport, you will need to complete the Domestic Passenger Screening process above as well as the International Passenger Screening. To protect against the threat of liquid explosives, there are rules for taking liquids, aerosols and gels (LAGs) on flights in and out of Australia. LAGs are classified as any liquid, gel, cream, paste or substance in an aerosol container. This includes water, drinks, toiletries, perfumes, cosmetics and food items that contain high volumes of liquids (soups, yoghurts, etc). It also applies to jam, honey and preserves. Can I take liquids, aerosols or gels through security if I am travelling overseas? Yes, but only if they fit within the current requirements. All liquids, aerosols and gels that you intend to take in your carry-on baggage must be in containers 100ml in volume or smaller (this is about equal to 100g in weight). They must be carried in a transparent, re-sealable, airtight bag no more than 80 centimetres (e.g. 20×20 cm or 15x25cm). Containers which exceed the LAGS restrictions, even if partially filled, will not be permitted through the screening point. LAG items are to be presented separately for screening and restricted to one bag per passenger, with exceptions for carers. Please place your airtight bag in a tray for screening. An item detected which contravenes the Australian Federal Government laws cannot be taken on-board an aircraft and will be surrendered at the screening point. For information on liquid, aerosol or gel items for babies or infants on international flights please see the TravelSECURE website. From 30 June 2018, people travelling internationally will notice some changes to how they are screened at the international screening point. Passengers will be required to present all powders in their carry-on baggage separately for screening, and inorganic powders will be restricted to volumes less than 350ml per passenger in the aircraft cabin on departing flights. Inorganic powders include things such as sand, salt, talcum powder and some types of make-up. You cannot tip powders out to fall under the 350ml/gm threshold as the restriction is calculated on total container volume. There is no quantity restriction for organic powders such as food products, therapeutic and medical products (travelling with a medical certificate is suggested), powdered baby formula, coffee and sugar. Domestic rules on powders have not changed, and international travellers will not need to unpack powders at the domestic screening point. For more information about duty-free purchases, handling powders at international screening points, powders in checked baggage, or further information about different types of powders and the rules that now apply to international travellers, please check the TravelSECURE website before you travel. Passengers departing the country may be randomly selected to undergo body scanner screening. Body scanners provide an additional layer of security detection with the equipment capable of detecting non-metallic prohibited items worn or carried on one’s body. The scanners use unobtrusive millimeter wave technology which emit low power levels and meets the health regulations in relation to licencing compliance. As such, internal medical devices including pacemakers and metal implants or women pregnant will not be adversely affected. Persons with a medical or physical condition that may prevent them from being screened by a body scanner will need to advise the screening officer. This will require the use of secondary screening processes. Privacy concerns have been diminished as the image displayed on the body scanner is a generic human profile with a general indicator of a detected item. A screening officer will apply the use of other screening techniques, including a targeted frisk search to clear an alarm. Refusal to be screened will mean you will not be permitted to pass through the security screening check-point or board your flight for 24 hours. Do not leave your baggage unattended at any time. Unattended baggage presents a security risk and may be disposed of by security personnel. Such incidents can cause disruption to airport operations which may also cause aircraft delays until the matter is resolved. A number of security personnel from various agencies, are deployed around the airport to monitor operations. Some may be identifiable by uniform, some may not. You may also see detector dogs in operation around the airport. Please remain respectful of other passengers, airport and airline staff. Refrain from making inappropriate remarks, including hoax bomb threats, threatening passengers or crew or taking replica weapons on board a screened air service. All are considered as criminal offences and will be dealt by law enforcement officers located at the airport. Canberra Airport has an extensive closed circuit television (CCTV) system in operation, both within the terminal and car parks as well as surrounding outdoor areas. Your movements may be recorded for security purposes. Like unattended baggage, idle vehicles within close proximity to the terminal represent a potential security threat. Vehicles dropping off passengers at the terminal are not usually idle and may be permitted to drop off passengers on the kerbside area, provided the vehicle does not ‘stand’. NOTE: any vehicle deemed to be idle may be moved on by security personnel. Private vehicles are not permitted to pick up passengers at the road kerb immediately outside the terminal. Vehicles may not park or ‘stand’ for extended periods while awaiting arriving passengers, or while carrying out any other function. Please use our Express Pick-up or 10 Minute Free Pick-up when you are collecting passengers. Passengers with impaired mobility or the elderly may need immediate access to the kerbside areas for pick-up. This must be pre-arranged by contacting the airport in advance. Please refer to our special assistance page here. TravelSECURE – Advice and tips to help you prepare for your journey and clear security checks quickly and easily. Smartraveller – Be informed, be prepared, advice for travellers. DFAT – Department of Foreign Affair and Trade.